There were some simply amazing posts by those involved in Ontario Education this week. My sincere thanks for taking the time to create the great content. There’s a great deal to think about in the selection that I’ve chosen to look at in this post. Please take the time to follow through to the original posts and comment. Or comment below. I was drawn to Alana Callan’s recent post because of the title. In reality, it was her thoughts about a post that she had read. So, I gave a Whew! and read on. I like the fact that she’s recognizing that the conversation is changing. It used to be that professional learning taught the tool and you hoped that pedagogy followed. Then, the pedagogs took over and everything was about the rationale for doings something and you hoped that the skills to actually use it came afterwards. The reality, it seems to me, is that both are needed but far more time and opportunities have to be provided to learners. I get a kick out of school systems that take students for 10 months to acquire skills but feel that two or three days devoted to formal “training” (whatever that means) gets the job done and you expect the world to change. We expect learning to be continuous for students; why shouldn’t we expect the same thing from professionals? Much time and efforts need to be devoted to professional learning for staff if you’re going to get substantial change. In light of that, I think it explains why so many of us continue to learn by making the connections to others online daily. We expect that students will try and fail in the learning process but we’re always there to help them get up and have another run at it. Shouldn’t the same philosophy and patience be devoted to staff learning? Let’s call this two for the price of one. Andrew Campbell started the discussion with what he saw as overhyped trends and Sheila Stewart focussed in on the last one – Parent Engagement. I guess I have a problem seeing this as a trend, much less one that’s overhyped. My parents were certainly engaged in my education. I couldn’t get away with anything and at least one of them were at the school at every opportunity. Even at university, I would get the inquisition whenever we got together! How was I doing on tests and projects and exams and …? I think that, as long as there have been parents, there have been varying levels of interest and involvement in student school. So, I don’t see it as a trend and I don’t care who defines it whether it’s poorly or not so poorly. Is the situation not one of attitude? As teachers, do we not want to recognize the role that a parent can play in making schools years a success? Yes, there are some parents that are more vocal than others. Yes, there are single parents. Yes, there are parents that work permanent midnights. Yes, there are so many permutations. It seems to me that the doors to communication need to be open. Telephone calls can be made. In today’s world, there are no shortages of opportunities to communicate. Parent Councils? Absolutely – you see them bringing in speakers to help parents understand life as it exists in today’s world. Nobody teaches you how to be a parent so every little bit helps. What would you do if you threw a party and the guest of honour didn’t show up? I was almost in that boat at the ECOO Conference. We wanted to have a panel discussion among the keynote speakers moderated by CBC Radio’s Nora Young. 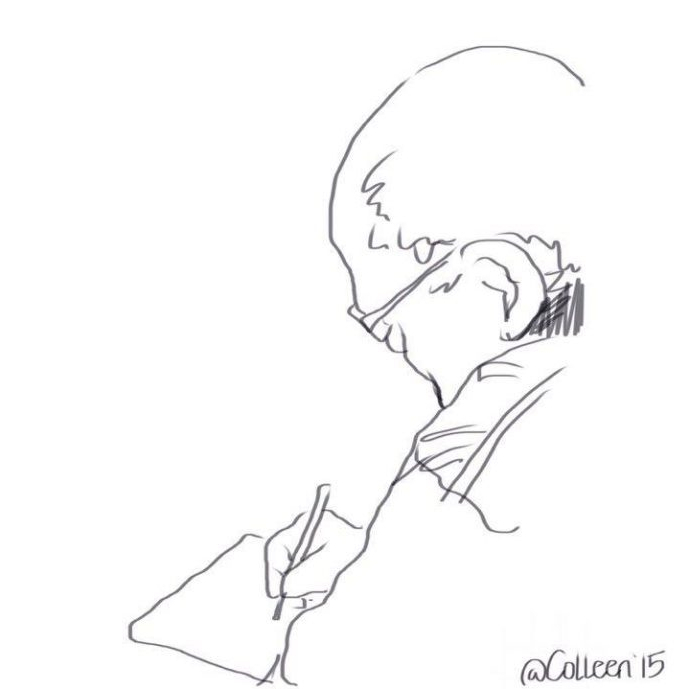 We had them all there but we were missing something important – the voice of now in schools. After all, the conference theme was Education in the Now Century. During the planning, when I raised the issue, Bill MacKenzie asked who I would recommend. One name popped to the front of my mind – Donna Fry. She was big in social media, was a classroom teacher, was an eLearning Teacher, was a vice-principal, and now was a principal. If there ever was a person who had experienced it all…. Things would have been a great deal easier if Donna could get to the conference by driving up the 407. That’s a little difficult when you live on the other end of Lake Superior! Read Donna’s post to get the details of her trip east. It wasn’t easy. After I got her situated on the stage, the least I could do was get her a glass of water – her only request. From there, she proceeded to steal the show! This picture from Royan Lee’s post says it all. I’m really at a loss to put any kind of spin on this one. The post and the comments from Royan’s readers say it all. If you’re not prepared to trust that teachers will use technology properly, I’d suggest that you just save your money and not buy the stuff. Or, maybe Alana is right. Just disable all functionality of the technology and then you won’t need to have professional learning or discourse. The students will be safe (the only possible reason I could think of this) and you won’t have to worry at all about making new content via pictures or movies documenting a child’s world. I don’t get Haiku. I don’t think I ever studied it. I don’t recall ever writing it. 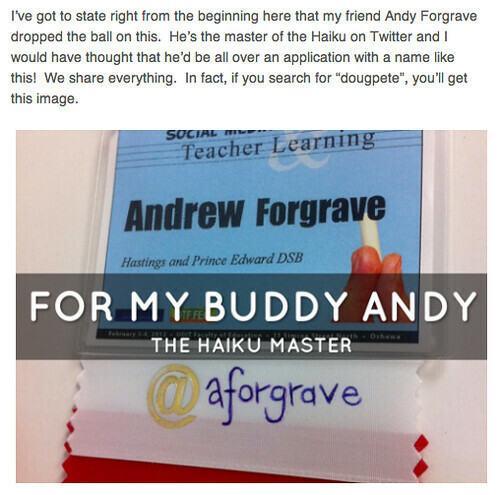 I do read it every now and again from the keyboard of Andy Forgrave who tags it #twhaiku. It’s obviously an art form I’m incapable of creating. But Andy can and I think his stuff is good. What do I know? At least it’s interesting. I wrote a post yesterday about Haiku Deck for the iPad. Since I know two things about Haiku – it’s a Japanese poetic form and Andy creates it – I figure the least I could do is make reference to his abilities in my post. I was also interested that Andy hadn’t shared it with me already. One of the joys of our infrequent get togethers is to have him teach me about his latest passion. After all, he was the one that introduced me to Prose with Bros. I didn’t expect that my post would inspire him to write a post back on his own blog. I also didn’t expect that he would analyze my thoughts in Haiku. Now I must confess – I’m not sure whether his post was positive or negative – it was just Haiku! Check out these posts at the links above or all the writers from the Ontario Edubloggers Livebinder. If you’re a blogger or an Ontario Educator who wants to be added to the Twitter Ontario Educator list, there’s a form there. Complete the form and I’ll get you added as soon as I can and I’ll create a personalize badge for your blog.